The Mission of Crossroads of Western Iowa Foundation is to support opportunities for individuals to draw strength from their abilities by promoting independence, confidence and self-worth that facilitates lasting change. The Vision of the CWI Foundation is to support opportunities for individuals to draw strength from their abilities. Since 1975, Crossroads of Western Iowa has pursued its vision of uniting with the communit to create opportunities for excellence. 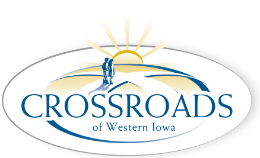 From its humble beginnings in Monona County, Crossroads has expanded and its reach now extends throughout the greater Western Iowa region with agency offices in Pottawattamie, Harrison, Monona and Woodbury counties. The CWI Foundation formed it's charter on February 1, 2005.